Population (2011): 29.8 million. 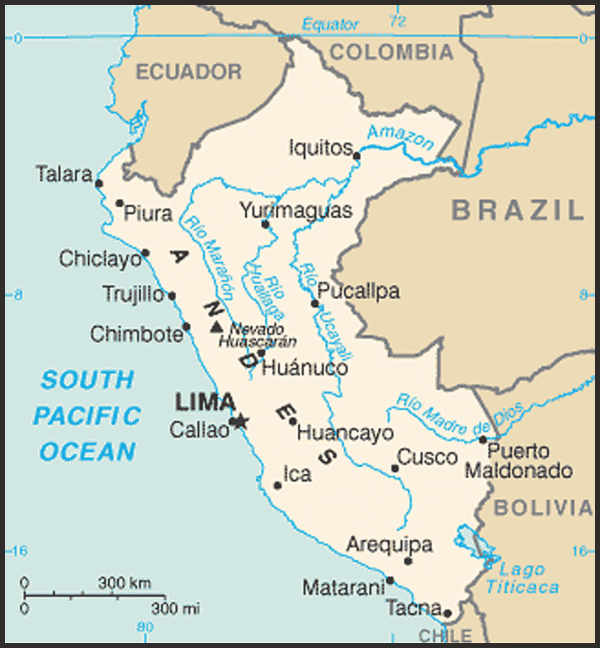 Close to 30% of the population lives in the Lima/Callao metropolitan area. Education: Years compulsory: 11. Attendance — ages 6-11, 92%; ages 12-16, 66%. Literacy — 96% in urban areas, 80% in rural areas. Health: Infant mortality rate (2006): 29.96 per 1,000. Life expectancy (2007) — 68.33 years male; 72.04 years female. Unemployment in Lima (2010): 7.9%; underemployment (2010): 42.5%. Branches: Executive: president, two vice presidents, and a Council of Ministers led by a president of the Council of Ministers (prime minister). Legislative — unicameral Congress. Judicial — four-tier court structure consisting of Supreme Court and lower courts. Annual growth rate: 0.9% (2009); 8.8% (2010). Manufacturing (2010): 15.0% of GDP. Types — food and beverages, textiles and apparel, nonferrous and precious metals, nonmetallic minerals, petroleum refining, paper, chemicals, iron and steel, fishmeal, footwear, chemicals, paper, machinery, furniture. Agriculture (2010): 7.5% of GDP. Products — coffee, cotton, asparagus, paprika, artichokes, sugarcane, potatoes, rice, banana, maize, poultry, milk, fruits, others. Other sectors, by percentage of GDP (2010): Services (55.6%), mining (5.2%), construction (6.7%), fisheries (0.3%). Trade (2010 Government of Peru customs statistics): Exports — $35.07 billion: gold, copper, fishmeal, petroleum, zinc, textiles, apparel, asparagus, coffee, others. Major markets — U.S. (16.3%), China (15.5%), Switzerland (11.0%), Canada (9.5%), Japan (5.1%), Germany (4.3%), Chile (3.9%), Spain (3.3%). Imports — $ 27.91 billion: petroleum and petroleum products, vehicles, plastics, steel, telephones, wheat, soy oil and soy products, corn, chemicals, commercial machinery, processed food, electronic goods. Major suppliers — U.S. (19.5%), China (16.8%), Brazil (7.4%), Ecuador (5.0%), Japan (4.5%), Colombia (4.6%), Mexico (3.8%). Most Peruvians are either Spanish-speaking mestizos — a term that usually refers to a mixture of indigenous and European/Caucasian — or Amerindians, largely Quechua-speaking indigenous people. Peruvians of European descent make up about 15% of the population. There also are small numbers of persons of African, Japanese, and Chinese ancestry. Socioeconomic and cultural indicators are increasingly important as identifiers. For example, Peruvians of Amerindian descent who have adopted aspects of Hispanic culture also are considered mestizo. With economic development, access to education, intermarriage, and large-scale migration from rural to urban areas, a more homogeneous national culture is developing, mainly along the relatively more prosperous coast. Peru's distinct geographical regions are mirrored in a socioeconomic divide between the coast's mestizo-Hispanic culture and the more diverse, traditional Andean cultures of the mountains and highlands and Amazon indigenous communities east of the Andes. After independence, Peru and its neighbors engaged in intermittent territorial disputes. Chile's victory over Peru and Bolivia in the War of the Pacific (1879-83) resulted in a territorial settlement in which Peru ceded the department of Tarapaca and the provinces of Tacna and Arica to Chile. In 1929, Chile returned Tacna to Peru. Following a clash between Peru and Ecuador in 1941, the Rio Protocol — of which the United States is one of four guarantors (along with Argentina, Brazil, and Chile) — sought to establish the boundary between the two countries. Continuing boundary disagreements led to brief armed conflicts in early 1981 and early 1995, but in 1998 the governments of Peru and Ecuador signed an historic peace treaty and demarcated the border. In late 1999, the governments of Peru and Chile likewise implemented the last outstanding article of their 1929 border agreement. Peru and Chile still dispute the maritime boundary. Nagging economic problems left over from the military government persisted, worsened by an occurrence of the "El Nino" weather phenomenon in 1982-83, which caused widespread flooding in some parts of the country, severe droughts in others, and decimated the fishing industry. The fall in international commodity prices to their lowest levels since the Great Depression combined with the natural disasters to decrease production, depress wages, exacerbate unemployment, and spur inflation. Bloated state-owned companies compounded the deteriorating fiscal situation. The ensuing economic collapse was reflected in worsening living conditions for Peru's poor and provided a breeding ground for social and political discontent. The emergence of two terrorist groups — Sendero Luminoso (Shining Path) in rural areas in 1980, followed shortly thereafter by the Tupac Amaru Revolutionary Movement (MRTA) in Lima and the Amazonas — sent the country further into chaos. The terrorists were financed in part from alliances with narcotraffickers, who had established strongholds in the Peruvian Andes and Amazon basin during this period. Peru and Bolivia became the largest coca producers in the world, accounting for roughly four-fifths of production. Amid inflation, economic hardship, and terrorism, Alan Garcia Perez of the American Popular Revolutionary Alliance (APRA) won the presidential election in 1985. The transfer of the presidency from Belaunde to Garcia on July 28, 1985, was Peru's first transfer of power from one democratically elected leader to another in 40 years. The Garcia administration's economic mismanagement led to hyperinflation from 1988 to 1990. Concerned about the economy, the increasing terrorist threat from Sendero Luminoso, and allegations of official corruption, in 1990 voters chose as President a relatively unknown mathematician-turned-politician, Alberto Fujimori. Although he ran on a populist platform, promising not to implement the macroeconomic shock package proposed by his opponent, novelist Mario Vargas Llosa, the severe economic situation forced Fujimori to carry out radical changes. He immediately implemented drastic economic policies to tackle inflation (which dropped from 7,650% in 1990 to 139% in 1991), but encountered opposition to further economic reforms, including dealing with the growing insurgency. On April 5, 1992, Fujimori dissolved the Congress in an "auto-coup," set aside the 1979 constitution, and carried out a mass firing of judges and "reorganization" of the courts. Later, pressured by the international community, Fujimori called new congressional elections. With a large majority in Congress, Fujimori proceeded to govern unimpeded, and in 1993 pushed through a new constitution with a strong executive function. Fujimori's security advisor, Vladimiro Montesinos, used bribes and intimidation to co-opt large segments of the judiciary, military, and media. The government unleashed a counterattack against the insurgencies that resulted in numerous human rights abuses on both sides and eventually quashed the Shining Path and MRTA. During this period Fujimori introduced far-reaching legal and economic reforms, privatized most state-owned companies, removed investment barriers, and significantly improved public finances. After a short but intense border war, Fujimori reached a milestone peace accord in 1998 with Ecuadorian President Jamil Mahuad related to the common border, ending decades of hostility between the two countries. Fujimori mired Peru in political and economic turmoil with his questionable decision to seek a third term and his subsequent tainted electoral victory in June 2000. The Organization of American States (OAS), as well as the U.S. and many other states, refused to recognize the election results. A political bribery scandal broke just weeks after Fujimori began his third term in July, forcing him to call new elections in which he would not run. Fujimori fled to Japan and resigned from office in November 2000. A caretaker government under Valentin Paniagua presided over new presidential and congressional elections in April 2001. In the presidential contest, Alejandro Toledo defeated Alan Garcia in a runoff and took office on July 28, 2001. The Toledo government consolidated Peru's return to democracy, a process that had begun under President Paniagua. Despite being a frequent target of political and media criticism, Toledo maintained strong commitments to freedom of the press. The government undertook initiatives to implement the recommendations of the Truth and Reconciliation Commission (TRC), which had studied the circumstances surrounding the human rights abuses and violations committed between 1980 and 2000. Prosecutors brought criminal charges against former president Fujimori for corruption and human rights violations. Authorities in Chile detained Fujimori in November 2005 and extradited him to face criminal charges in Peru in September 2007. In December 2007, a Peruvian court convicted Fujimori of ordering an illegal search and seizure of documents and sentenced him to 6 years in prison. In April 2009, a court convicted Fujimori of human rights violations and sentenced him to 25 years in prison. Another court convicted the former president in July and September 2009 on embezzlement and corruption charges, respectively, and sentenced him to 7.5 years, and ordered him to pay $10 million in civil reparations. Under President Toledo, Peru negotiated a trade promotion agreement (the PTPA) with the U.S. Toledo also unveiled plans to construct a road connecting Brazil and Peru's isolated interior to the Pacific coast. Toledo's economic management — a continuation of Fujimori's — led to an impressive economic boom in Peru. Poverty reduction was uneven, however. Although poverty in some areas decreased to 15.8% during the Toledo administration, nationally it only decreased by 9.8% and nearly half (44.5%) of Peruvians were still living below the poverty line. In 2005 the government implemented "Juntos," a program to double the income of people living in extreme poverty (17.4% that year). APRA candidate Alan Garcia Perez won the June 2006 runoff presidential election with 52.5% of the vote, defeating Ollanta Humala, who won the first round under the Union for Peru party banner, with the support of his Peruvian Nationalist Party. APRA also won 36 congressional seats and controlled the largest voting bloc. After his disappointing presidential term from 1985 to 1990, Garcia returned to the presidency with the intention of turning around the perception of him that his first term had generated. During his second term, Garcia oversaw a robust macroeconomic performance, including strong GDP growth and declining poverty levels (39.3% of Peruvians were "poor" in 2007, 36.2% in 2008, and 34.8% in 2009). Garcia faced the most acute crisis of his second term in June 2009, when indigenous protesters and police clashed violently nearly the remote Amazon town of Bagua. The conflict left 10 protesters and 24 police officers dead, and caused a dramatic drop on Garcia's approval rating. Internationally, Garcia sought to reenergize Peru's international relations and economic relations with the world and to showcase Peru's democratic and pro-free trade path as a model for the region. He successfully hosted two international summits in 2008, the European Union-Latin America and Caribbean summit and the Asia-Pacific Economic Cooperation (APEC) leaders' summit, and the Organization of American States General Assembly in 2010. 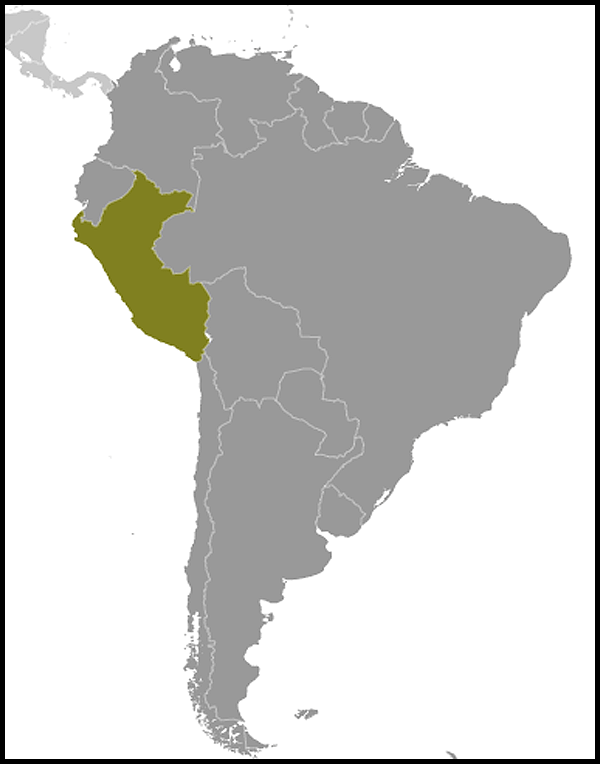 The U.S.-Peru Trade Promotion Agreement (PTPA) went into effect in February 2009. Ollanta Humala Tasso, runner-up to Garcia in 2006, won the most votes in the first round of the 2011 presidential election. In the June 5, 2011 runoff, Humala defeated opponent Keiko Fujimori, daughter of imprisoned former president Alberto Fujimori, by a 51.3% to 48.7% margin. Since taking office July 28, President Humala has made social inclusion his administration's central theme. On October 24 the Peruvian Congress formally created a new Ministry of Development and Social Inclusion, with operations beginning on January 1, 2012. President Humala named economist Carolina Trivelli Avila to be the first head of the new ministry. On December 10, 2011 President Humala undertook a major cabinet reshuffle, replacing the Prime Minister and 10 other ministers. The president is popularly elected for a 5-year term. A constitutional amendment passed in 2000 prevents immediate reelection, but allows unlimited nonconsecutive terms. The first and second vice presidents also are popularly elected but have no constitutional functions unless the president is unable to discharge his duties. The principal executive body is the Council of Ministers, headed by a prime minister and comprised of 18 members following the creation in October 2011 of the Ministry of Development and Social Inclusion. The president appoints its members, who must be ratified by the Congress. All executive laws sent to Congress must be approved by the Council of Ministers. The legislative branch consists of a unicameral Congress of 130 members. In addition to passing laws, Congress ratifies treaties, authorizes government loans, and approves the government budget. Peru is divided into 25 regions that are still sometimes referred to as "departments." The regions are subdivided into provinces, which are composed of districts. High authorities at the regional and local levels are elected. The country's decentralization program is designed to return some of the mining and hydrocarbons royalties (canon) to the regions so that infrastructure projects can take place. Peru maintains an embassy (http://www.peruvianembassy.us/en.html) in the United States at 1700 Massachusetts Avenue, NW, Washington, DC 20036 (tel. (202) 833-9860/67, consular section: (202) 462-1084). Peru has consulates in Atlanta, New York, Paterson (NJ), Miami, Chicago, Houston, Denver, Los Angeles, San Francisco, Boston, and Hartford. Peru's economic growth was strong over the 7 years up to 2010, averaging 7.0% a year (including 2009, the year the economy grew only 0.9% as a consequence of the global financial crisis). This growth resulted largely from market-oriented economic reforms (which included measures to promote trade and attract investment) and privatizations in the 1990s, aided by high international prices for Peru's largest commodity exports. Real GDP grew 8.9% in 2007, 9.8% in 2008, 0.9% in 2009, and 8.8% in 2010. Economic expansion in recent years has been driven by construction, private investment (mainly in mining and oil and gas projects), and domestic consumption. Peru's economy is well managed, and better tax collection has been increasing revenues, with expenditures keeping pace. Private investment is rising and becoming more broad-based. Peru obtained investment grade status in 2008. In view of his appointment of a respected economic team and actions taken during his first 100 days in office, many anticipate that President Ollanta Humala will continue the sound economic policies of several prior administrations. While seeking to continue the well-functioning economic engine inherited from its predecessors, the Humala administration is pursuing a social inclusion agenda with the goal of ensuring that the lower classes increasingly benefit from Peru's economic success. Peru weathered the 2008 global financial crisis well and was one of the few Latin American countries that had a positive growth rate in 2009. Annual average inflation receded to 2.9% in 2009 and 1.5% in 2010 after jumping to 5.8% in 2008 due mostly to substantial global food and oil price increases. Three consecutive years of fiscal surplus turned into deficits of 1.6% of GDP in 2009 and 0.5% in 2010, but a 1% surplus was projected for 2011. Thanks to pre-payments and lower borrowing, public external debt in 2010 dropped to $19.9 billion or 12.9% of GDP (compared to 70.9% at the end of 1988). Foreign reserves were a historic $44.1 billion at the end of 2010 and $48 billion at the end of September 2011. Peru and the U.S. signed the U.S.-Peru Trade Promotion Agreement in April 2006 in Washington, DC. The PTPA was ratified by the Peruvian Congress in June 2006 and by the U.S. Congress in December 2007. The Peruvian Government passed several changes to its environmental and intellectual property laws in order to allow the PTPA to enter into force on February 1, 2009. Peru's exports of goods reached $35.1 billion in 2010, partly as a result of recovering mineral prices. Peru's major trading partners are the U.S., China, EU, Switzerland, Canada, and Japan. According to U.S. Government statistics, after 9 years of deficits, the United States registered 3 years in a row of trade surpluses with Peru during 2008-2010, with Peru exporting $5.1 billion and importing $6.8 billion in 2010. Peru's exports include gold, copper, crude oil and petroleum products, coffee, asparagus, apparel, molybdenum concentrates, and others. Imports include machinery, chemicals, computer and electronic products, petroleum products, electrical machinery, plastics, vehicles, steel, and cereals. Peru belongs to the Andean Community, the Asia-Pacific Economic Cooperation (APEC) forum, and the World Trade Organization (WTO). Peru has trade agreements with Chile, Mexico, Canada, Singapore, China, the European Union, South Korea, and the European Free Trade Association (EFTA), and is negotiating with Japan. Peru is also a participant in efforts begun in early 2010 to negotiate a regional trade agreement under the Trans-Pacific Partnership, which also includes the United States. The Peruvian Government actively seeks to attract both foreign and domestic investment in all sectors of the economy. Peru's Central Bank estimates that the stock of foreign direct investment (FDI) amounted to $41.8 billion at the end of 2010, while the U.S. Department of Commerce reported that U.S. investment in Peru on a historical-cost basis reached $7.9 billion in 2010, making the United States Peru's largest foreign investor. Spain and Chile are also leading investors. FDI is concentrated in oil and gas, telecommunications, mining, manufacturing, finance, and electricity. Peru is a source of both natural gas and petroleum. In August 2004, Peru inaugurated operations of the Camisea natural gas project. Camisea gas has transformed Peru's energy matrix, reducing the country's dependence on imported diesel and power rationing in drought times. The $3.8 billion Peru LNG project, commissioned in June 2010, has become the largest investment in a single project ever made in Peru. The plant liquefies natural gas for export to Mexico and other countries, converting Peru into a net energy exporter in 2010. For several years, Peru has maintained its position as the world's top producer of silver, second in zinc, third in copper and tin, fourth in lead, and sixth in gold. Mineral exports have consistently accounted for the most significant portion of Peru's export revenue, comprising 60% in 2010. Mining projects worth $50 billion are either in construction or undergoing the permitting phase, though many have been subject to delays due to local community opposition. Peru generally enjoys generally friendly relations with its neighbors, despite occasional bilateral tension with Chile. In November 1999, Peru and Chile signed three agreements that put to rest the remaining obstacles holding up implementation of the 1929 Border Treaty, which officially ended the 1879 War of the Pacific. In late 2005, a declaration of maritime borders by Peru's Congress set off a new round of tensions with Chile, which claims that the maritime borders were agreed to in fishing pacts dating from the early 1950s. The Garcia administration submitted arbitration of this dispute to the International Court of Justice at The Hague in hopes of finding an acceptable, apolitical solution, but the dispute remains in the headlines and continues to cause occasional friction. 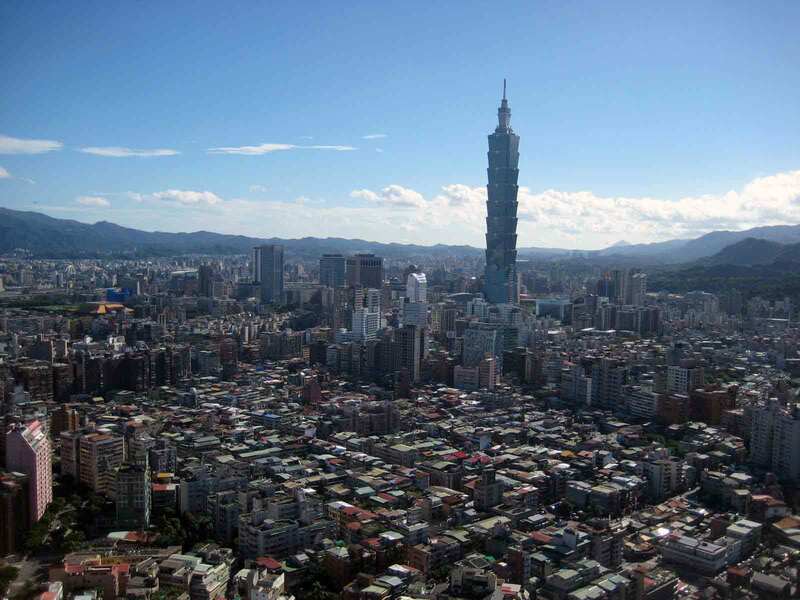 In 2009, a series of incidents renewed tensions between the two countries. These included Chile's "Salitre 2009" multinational military exercises and Chile's alleged quiet negotiations with Bolivia regarding that country's access to the sea. Relations with Chile became further complicated in November 2009, when a Peruvian Air Force non-commissioned officer was arrested for allegedly spying and passing classified defense information to Chile. In October 1998, Peru and Ecuador signed a peace accord to resolve once and for all border differences that had sparked violent confrontations. Peru and Ecuador now jointly coordinate an internationally sponsored border integration project. The U.S. Government, as one of four guarantor states, actively facilitated the 1998 peace accord between Peru and Ecuador and remains committed to its implementation. The United States pledged $40 million to the Peru-Ecuador border integration project and another $4 million to support Peruvian and Ecuadorian demining efforts along their common border. In 2009, the United States committed an additional $3 million to Peru's humanitarian demining program. In 1998, Peru became a member of APEC, facilitating closer ties and economic relations between Peru and Asian nations. Peru hosted the APEC summit in 2008 and is an active participant within the APEC forum. Relations were strained following the tainted re-election of former president Fujimori in June 2000, but improved with the installation of an interim government in November 2000 and the inauguration of the government of Alejandro Toledo in July 2001. Currently, the United States enjoys strong and cooperative relations with Peru, and relations with President Humala's administration remain positive. The United States continues to promote the strengthening of democratic institutions and human rights safeguards in Peru, and the integration of Peru into the world economy. U.S. investment and tourism in Peru have grown substantially in recent years. The U.S. remains Peru's number one trade partner, and economic and commercial ties have deepened with the 2009 implementation of the U.S.-Peru Trade Promotion Agreement. About 350,000 U.S. citizens visit Peru annually for business, tourism, and study. About 22,000 Americans reside in Peru, and more than 400 U.S. companies are represented in the country.